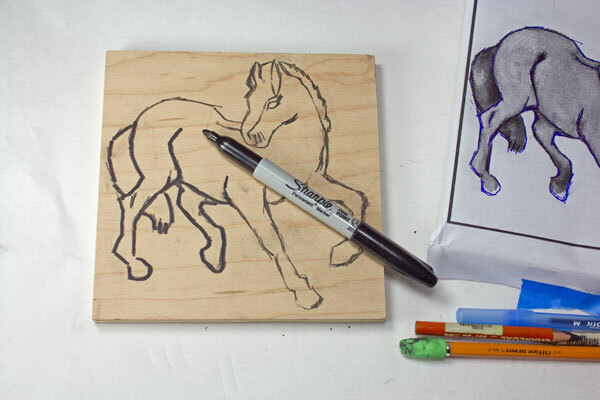 This article explains how to use a charcoal pencil (or graphite pencil) to color the back side of a paper pattern and then trace over the pattern firmly to transfer it to a plywood mosaic backer board. I have written a separate article explaining why tracing borrowed images is better than drawing for making patterns for small mosaics -even when the purpose is to create original artwork. If your backer is much larger than your pattern, you can enlarge the pattern by transferring it to the backer using the grid method of pattern transfer instead of the method I explain here. 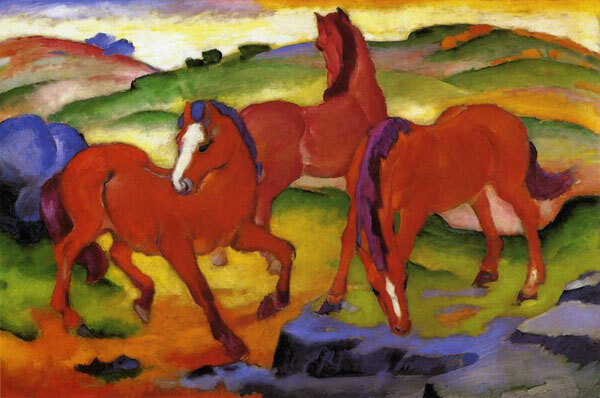 Large Red Horses fauvist painting by Franz Marc includes a prancing horse that is rich with curves that suggest motion. I used Photoshop to crop and size the image and convert it to a black and white, but you can also use photocopies from books and your own drawings as starting points. 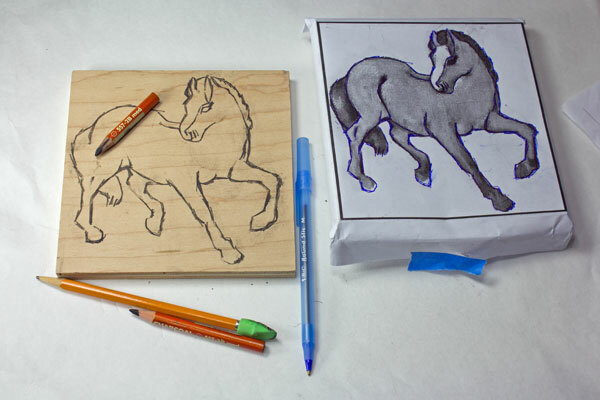 Read more about this process in my article How To Make Mosaic Patterns Without Drawing. Note that the image was sized so that it was 6×6 inches and printed out on regular printer paper. Photoshop was used to crop out a detail of the painting and convert it to a black and white image that emphasizes outlines. I also added a border to mark the 6-inch x 6-inch space to make it easy to line up the paper on the backer board. 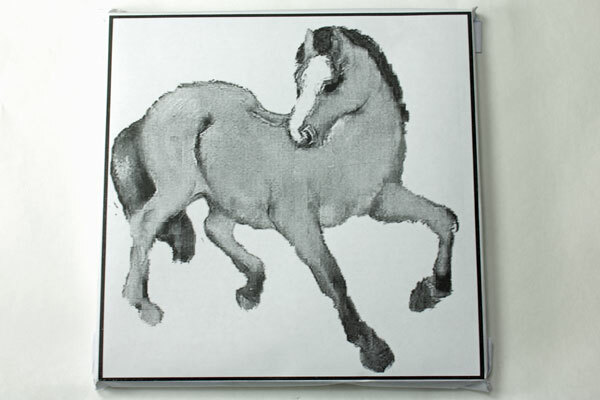 The outlines of the black and white image are what we will transfer to the wood mosaic backer. Fold the paper pattern around the backer board so that the image of your figure is centered on the board. Having a border drawn the same size as the backer board helps you line it up. 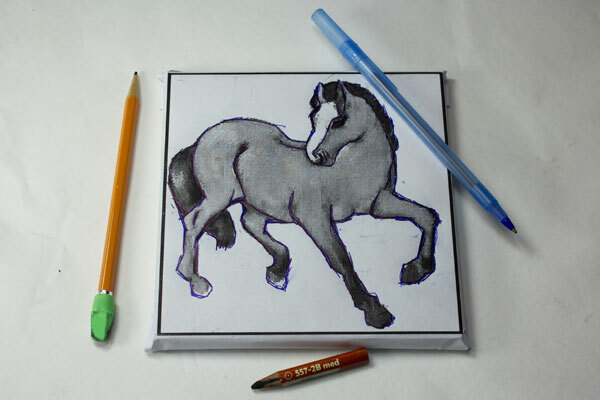 Fold your mosaic pattern around the backer board so that the image is centered. 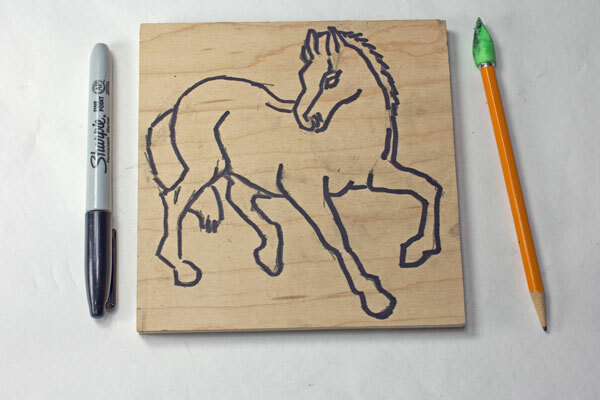 Note that my pattern should have centered the horse better in the square so that the tail isn’t so close to the edge. If the pattern transfers as shown, it will be difficult to render that part in tile, and i will need to make the tail slightly thinner so that I can put some background around it because tile can only be cut so thin. Unfold the mosaic pattern and remove the backer board. The folding was only done to get the paper creased at the edges of the pattern. Rub the outlines of the figure with a charcoal pencil (preferred) or a regular graphite pencil. Note that we are rubbing the BACK of the pattern not the front. Color every line that will need to be transferred. Refold the mosaic pattern around the backer board and tape it in place, preferably with some easy to remove painter’s tape. 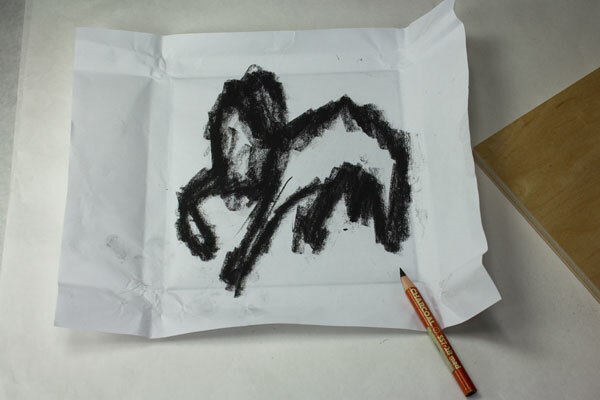 The creases in the prefolded paper made it easy to line the pattern up without smearing the charcoal all over the wood. Note that the tape goes on the VARNISHED side of the wood. The charcoal pattern will be transferred to the UNVARNISHED side. Trace the outlines of the figure firmly with a ballpoint pen or a pencil that is more dull than sharp. 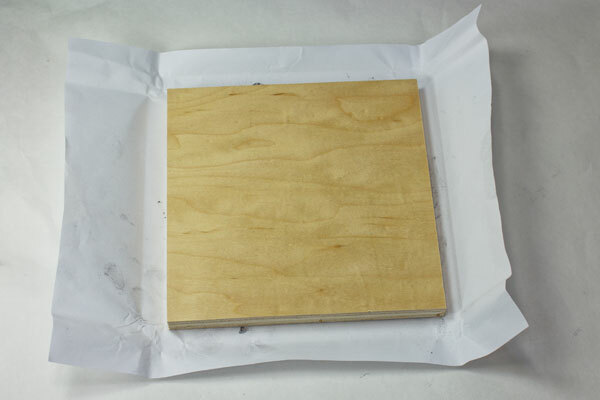 You want to press firmly so that the charcoal on the back of the paper pattern is transferred to the wood, but you don’t want to rip the paper. Avoid getting the paper humid or wet for this reason. Make sure you trace all the lines (curves) you would like to see on your backer. When you remove the paper pattern, you will notice small places where the lines (curves) of the design didn’t get transferred for whatever reason, usually because you forgot to trace there or sometimes because you didn’t put charcoal in those places. You can fix those by drawing the missing lines. It is easy to do even if you have little confidence in your ability to draw because the existing lines give you a frame of reference. Make the lines of your transferred patterns permanent using a fine-tip marker such as the Sharpie brand. If you don’t do this step, then your hands and glue will quickly rub off the pattern. The Mosaic pattern is transferred ready for tiling. This is a dry indoor mosaic, and so the tile can be attached with Weldbond Adhesive. For outdoor and wet mosaics. a concrete stepping stone or piece of flagstone could be used for a backer and the tiles mounted with thinset mortar. 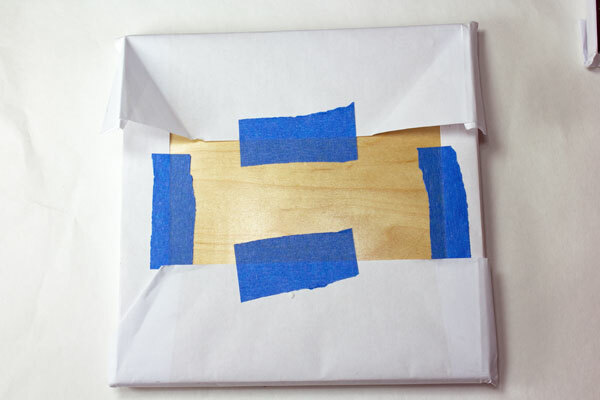 Instead of folding the paper pattern around the backer, it could have been cut to the size of the backer and taped on that way. Instead for rubbing charcoal or graphite pencil on the back of the pattern, carbon tracing paper could have been used. This entry was posted in Step by Step Instructions and tagged beginner, pattern on December 20, 2015 by Joe Moorman. Very helpful information! Thanks for sharing! I am a new mosaic artist; I’m 54 and I’ve never been artistic my whole life. I love this craft! This article was extremely helpful! I am just starting out as a mosaic artist. I have taken a number of classes at Chicago Mosaic school. I love mosaics as an art form. Also, I am not formally trained as an artist. But, I have studied textiles and have created hand knit clothing extensively. My question is, when preparing setting bed I find it difficult retrace/ recapture piece after covering image with thin set? Is it better to work in sections? Will this technique assist with re-creating the design as you set tesserae in mortar bed? Also is mesh more commonly used? I find that thinset is challenging, although I love working with smalti. Is thin-set the optimal choice as an adhesive for smalti? What do you suggest? Working in sections is always best, but you have to make sure you get the sheets lined up during installation and avoid having a slightly larger gap between sheet, which is a common problem. You can work in sections even if your tile isn’t in a grid arrangement.